This lot has been repackaged with Sims2Pack Clean Installer and contains no hacks, careers, or unwanted/unneeded files. My lots will not be offered as zip files as rar files compressed at the best rate reduce file size by at least an extra 25% - we all have a responsibility to help keep site costs down right? 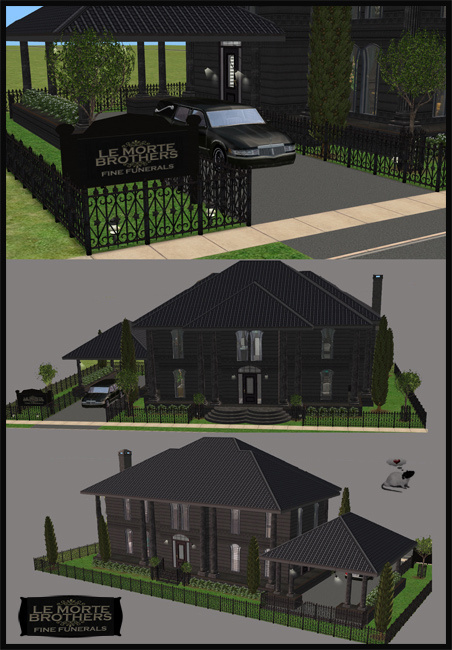 The Le Morte Brothers never had any ambition other than to follow in their familial footsteps and run the family business. This large and sombre building, handed down from generation to generation, encompasses the business on the ground floor and a 2 bedroom residence upstairs. 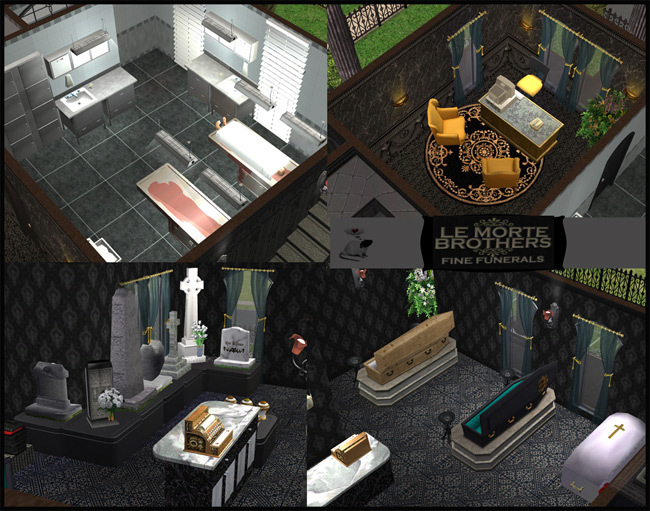 While the living area may be a little run down - the mortuary is state-of-the-art as is the stock in the showroom. An office and *visitors room* complete the ground floor and toilet facilities are available for guests (the live ones) and owners/workers. The residence features a large living and kitchen dining area, 2 double bedrooms and a well appointed bathroom. The business is being sold complete with with a fully registered and insured traditional hearse. 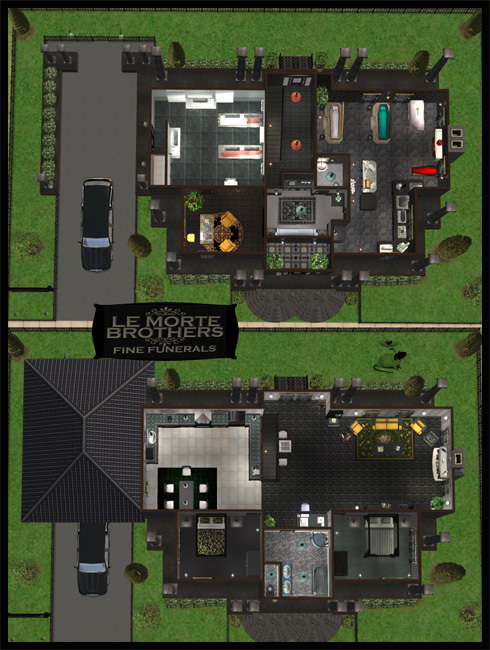 Le Morte Brothers Lot.rar containing the lot file, walls, floors, windows and doors - install using either TS2 Installer or Sims2Pack Clean Installer. 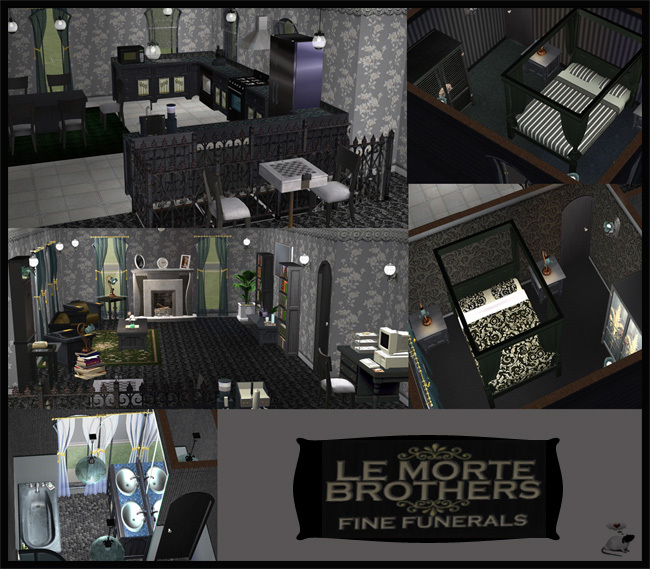 Le Morte Brothers Objects&Recolours.rar containing the necessary objects and recolours. Place these files in your Downloads directory. file: Green greek key rug creator: dmg @ ??? file: Swirly silver tile creator: Evilkitten ?? ?